For the last month, I have challenged myself to try new formulas of products I love. Typically, this means trying a liquid or cream version of a products that I usually prefer as a powder: eyeshadow, contour, bronzer. I’ve done this in part because I’ve had some version of a cold or sinus infection since the start of the month, and my skin is parched and needs all the moisture it can get. But it was also inspired by all the hype (and controversy) on social media over this month’s Boxycharm selections, namely the Temptu Shimmer Bronzer. So I wanted to do a review of this product before I reviewed the whole box, for two reasons: One, it is amazing. Plain and simple, this is a good product, and so easy to use. But two, I wasn’t initially thrilled about receiving it, and I’m guessing many of you who subscribe to Boxycharm might feel the same way. I love this product. It might be my favorite item this month, and this from an eyeshadow junkie who received not only an eyeshadow trio but an eye brush set in this box! It is a liquid formula, but it isn’t too runny, so it’s easy to work with. It sets nicely–even with soap and water my arm swatches (below) didn’t come off completely. But you do have enough time to blend it out before it sets–it’s not like the Benetint products that often left me with spots on my cheeks because I didn’t work at lighting speed. And it blends seamlessly into the skin. 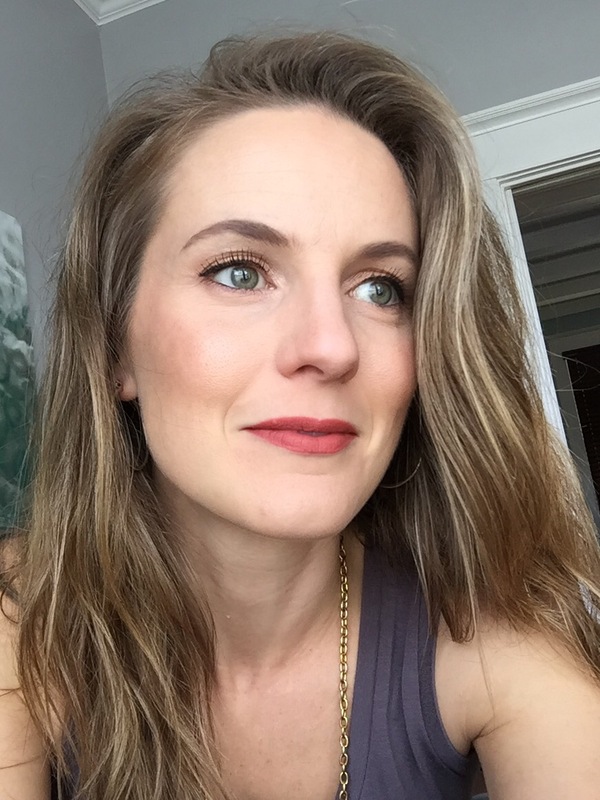 It’s kind of amazing actually: I see myself dotting it on my cheek, blending it out with my makeup sponge, and all of a sudden it’s gone, but my skin just looks warmer and healthier. But it still looks like my skin. I love that. The best way I’ve found to use it: Squeeze a pearl-sized amount on the back or your hand. Dot some of it on one cheek, blend that out, then repeat on any areas you want more color. Add more to build color if you wish. Dotting it on with your fingers then blending with a makeup sponge (rather than dotting it on with the sponge) prevents too much product from being soaked up by the sponge. Once it’s blended, you won’t be able to see it, but I think that’s kind of the point. Take a step back from your mirror and you’ll see a natural-looking warmth to your skin. I know many people worry about a shimmery bronzer. I can honestly say while that this product does have shimmer in it when you squeeze it out of the tube, when sheered out that shimmer is not visible at all. Your skin glows, but there is no obvious glitter. This is a very neutral-toned bronzer. It would work well for warm or cool skin tones, from fair to medium. If your skin is deeper than medium it probably would not show up unless you really built up the color. As far as the shade, many swatches you see on Instagram and YouTube are at full strength–one swatch right out of the bottle. Below I’ve showed that type of swatch, but beneath it I’ve also sheered it out so you can see the difference. Keep in mind that, even sheered, this is still a concentrated swatch. It would be even more sheer blended over a larger area on the face. If you want more color, this product builds nicely. It doesn’t move your makeup around or pick up your foundation when you pat it on the way some cream or liquid products can. I do recommend using it before you powder, since powder can make liquid product drag a bit. I think it would work on every skin type. It makes my dry skin glow, but because it sets completely and doesn’t feel tacky or sticky as some cream products can, it would likely work well for oily skin. As I said, I cannot test this on myself, but I can compare this product to other creams and liquids I have, and it sets the best of all of them. Also, I’ve tried this product on my eyes for a minimal makeup day, and it is beautiful blended into the crease. If you are really pale and still feel this bronzer is too dark to use on your face, try it this way. It is nearly undetectable, but your eyes look a little more vibrant and contoured than they do with no product at all. Final Word: This is a great product, and I honestly could see myself repurchasing it when I use up this bottle. That said, you need so little that this bottle will last a long time, so who knows when that will be. I mean, a dot the size of a pearl is almost too much to bronze your cheeks and the perimeter of your face. So at $29.50, I think this is a good value. This bronzer is awesome, but it caused quite a stir on social media. Early in the month, Boxycharm told subscribers it was one of four items they might receive. The others were a Cargo blush, a Cargo powder bronzer, and an Ofra highlight. And here is where the trouble began. Temptu is generally not as well known as Cargo and Ofra, and those who do know them remember them as a airbrush makeup company (this is not an airbrush product). Also, most people are nervous about cream or liquid bronzers–they’re just not as common as powders. So of course everyone was excited for the better known products and formulas, and disappointed if they didn’t receive them. Initially, I was one of these people. And I think these feelings are valid. 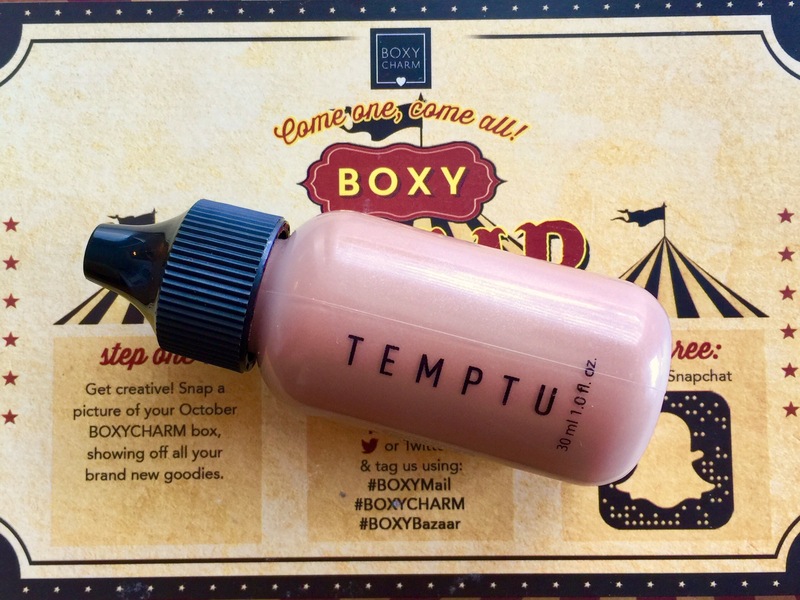 Subscribers want to know that the products that are promoted on Boxycharm’s social media will appear in our boxes–this helps us trust the company. Even though it’s not always accurate, most of us typically assume products we don’t know are lesser quality than those we do. And no one likes to think that their box has lesser quality products –even if they are the same monetary value–than another subscribers, since we all pay the same $21 for the subscription. Ultimately, I think what most people were really upset about was not the bronzer at all–it was the somewhat misleading advertising. It made the company a little less trustworthy this month, and that is disappointing. If you are in this camp, I would encourage you to give this bronzer a try. Even if you’re upset. Because in the end, why do we love subscription boxes? For me, it’s not just getting a lot of products for a low price, though that is fun. But I love subscription boxes because they push me to try new things. They keep me from getting stuck in a makeup rut of using the same products from the same brands in the same formulas over and over again. They force me to be a little creative, to experiment, and to allow myself to fail. Does every product work? No. Would I buy every product again? Of course not. But I tried something I never would have bought for myself, and I love that. It can be hard to remember when I see photos of other products that have received a lot of hype, but in the end I’m so glad I received the product that challenged me. I love Boxycharm, and I ultimately loved this month’s box. I do wish Boxycharm had promoted it differently, but I think the bronzer is fantastic. I never, ever would have tried a liquid bronzer if I hadn’t been pushed to, and now I can’t recommend it enough. Even if you’re not a Boxycharm subscriber but this product interests you, I say go for it. you might be surprised how much you like it. Of course, there’s always a chance you’ll hate it. But you took a chance and tried something new, and that is to be celebrated.